Wildlife biologists are primarily responsible for studying the biology, behavior, and habitats of a variety of animal populations in the wild. If they hold advanced degrees, wildlife biologists may find employment in higher education, usually as college professors. They may also work for the state or federal government in conservation or research roles, often within agencies such as the U.S. Fish and Wildlife Service. Private-sector employment may be secured at zoos, community centers, environmental research facilities, and consulting firms. Conduct census projects, research studies, and complex data analysis. Trap, tag, or relocate animals for conservation purposes. Develop land and water use plans. Work to save endangered species. Evaluate the impact of commercial ventures on local wildlife. Interact with fish and game wardens and wildlife rehabilitators to coordinate the management of local wildlife. Write research papers, scientific reports, and scholarly articles to explain findings. Present findings to academics, the general public, and other stakeholders. Wildlife biologists have many diverse duties that could include the tasks above and more. In general, they must use their knowledge of wildlife and habitats to manage and study animal populations. A wildlife biologist usually has a degree in wildlife or fisheries management or a related area. Education: A bachelor’s degree is required at minimum, while a master's degree or doctorate is generally preferred by most governmental and private employers. These degrees typically involve the completion of coursework in wildlife conservation and management, population dynamics, animal behavior, genetics, zoology, ecology, anatomy and physiology, biology, botany, chemistry, statistics, and wildlife or environmental law. Certification: The Wildlife Society offers the field’s professional designation: Certified Wildlife Biologist (CWB). CWB applicants must meet educational requirements and have at least five years of professional experience. Wildlife biologists who have not yet achieved the requisite professional experience may be granted Associate Wildlife Biologist (AWB) certification status. Once certified, the wildlife biologist must complete at least 80 hours of continuing education every five years. Communication skills: Wildlife biologists must be able to effectively write research papers and reports. They also need to communicate clearly—verbally and in writing—with the public, policymakers, and other stakeholders. Observation skills: It's critical to notice slight changes in an animal’s behavior or appearance and observe several elements in animals' surroundings. Critical-thinking skills: Wildlife biologists must be able to draw conclusions from experiments, research results, and scientific observations. Problem-solving skills: Wildlife biologists must find solutions to help protect animals and wildlife from possible threats. The Bureau of Labor Statistics projects that employment for wildlife biologists will grow slightly more than the average for all professions, at 8 percent through the year 2026 compared to 7 percent for all occupations. 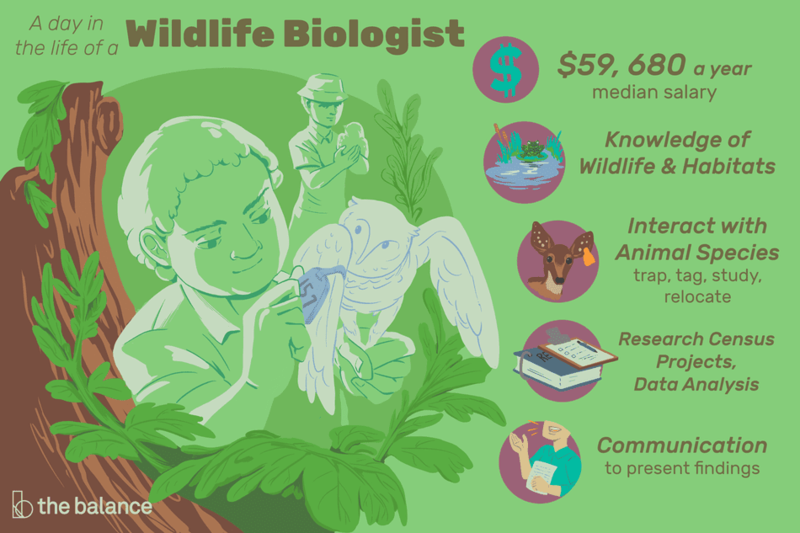 Wildlife biologists who hold master's or doctorate degrees will have the greatest number of career options over the next decade, especially in the areas of research or academia. In addition to their routine administrative office duties, wildlife biologists frequently work outdoors in potentially harsh weather conditions. They may interact with and study any number of animal species in the population of local wildlife, including deer, moose, raccoons, opossums, migratory birds, birds of prey, reptiles, marine mammals, bats, big cats, fish, and amphibians. Most wildlife biologists work full-time, and they may work long or irregular hours, especially when working in the field. Complete a internship in wildlife conservation to gain the experience for certification. Apply to become an Associate Wildlife Biologist® or Certified Wildlife Biologist® through The Wildlife Society. Leverage your internship to be connected to job opportunities or look for jobs and apply on sites such as Indeed and LinkedIn.